The skin on my back tingles from the warm, light touch. I’m not sure whether it’s the delicate fingers of the charming Thai woman spreading warm oil, or the caress of the playful sea breeze that silently slips in through the stylish sala’s open window. Rich and mysterious herbal scents infuse the room. Almost imperceptibly, my body moves in rhythm to the subdued tones of soft instrumental music playing in the background, as the spa therapist magically works her fingers along my spine. Through the dancing, flowered branches of the frangipani trees just outside, I dreamily watch the turquoise waters of the sea blend seamlessly into the rich blue sky. Time slows to a crawl as I drift deeper into total relaxation, leaving the world behind. This is the ultimate indulgence of a Thai spa. When the pace and pressure of work, family, and modern living builds up, a few hours in a Thai spa is the ultimate way to relax and rejuvenate. The Kingdom’s spas recharge your spirit with a gentle Thai touch. Starting from the art of Thai massage and ancient healing techniques, Thai spas encompass a holistic healing approach to calm and nourish both your mind and body. With more than 500 spas, Thailand is the perfect place to pamper yourself. You can choose a spa to match whatever treatment you want, your budget and the ambience that soothes your soul. 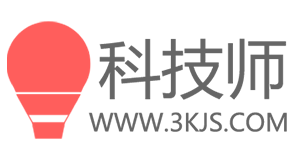 Thailand offers an unbeatable choice of massage centers, day spas, spa resorts, destination spas, and health & wellness centers. My dream in life is to try them all! According to the Federation of Thai Spas, more than 5.5 million people visit spas in the Kingdom each year. The calm and caring atmosphere, combined with the Thai tradition of subtle, personal service, sets Thai spas apart from their equivalents in other countries. Only at a Thai spa can you benefit from thousands of years of traditional wisdom that combines the power of nature, herbs, and massage techniques to restore your inner harmony and natural balance. A visit to a Thai spa is even more exceptional when you can connect with the magnificence of nature, enjoying a feast for the eyes as well as the senses. Here are five “spas with a view” in Thailand that give you a fully-encompassing experience where you truly feel at one with nature. Located on Ko Samui, Six Senses Samui offers fantastic views of the Gulf of Thailand with a view of blue water stretching out to the horizon, broken only by rugged islands that dot the coast. Located on 20 acres of gently sloping headland on the island’s north end, Six Senses Samui is a tropical hideaway with lush vegetation that keeps it very private. The Six Senses Spa takes full advantage of the site with a spectacular sea view. An outdoor treatment room perched high above the rocky shore has open railings that let you take in the view and feel a gentle sea breeze while you are being cared for. There is also an indoor treatment room where three full glass walls let all the glorious sunlight and scenery in. They also open for an invigorating flow of fresh air. 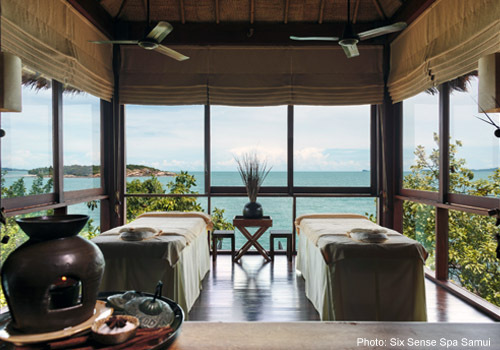 The Six Senses Spa emphasizes de-stressing programs. 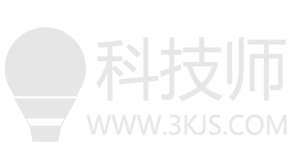 It offers a wide choice of holistic and traditional treatments using naturally-derived and-ethically produced spa products. Six Senses Samui is located on the northern tip of Samui Island, approximately six kilometers and 15 minutes by car from Samui International Airport. Nestled along the coast near the view point between Chaweng and Lamai, the Baan Hin Sai Resort & Spa is a tranquil getaway secluded from Ko Samui’s main tourist areas. Seaside cliffs offer a stunning view of the Gulf of Thailand. The combination of natural rock formations and splendid greenery give the resort a feeling of being especially entwined with nature. 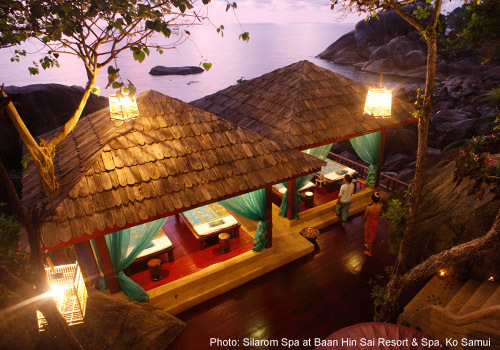 The Silarom Spa at Baan Hin Sai Resort features traditionally-styled, open-air pavilions that are built right into a rocky outcrop, where dark wood contrasts with the grey stone. You’ll feel an especially strong bond with the sound and scent of the sea while you savor one of the spa’s signature treatments, an authentic royal court massage, or choose one of the options to refresh, relax or recharge yourself. The seafront gazebo provides indoor treatments, with glass walls so you can still delight in the marvelous view. Even the sauna rooms overlook the rocks and the sea. Baan Hin Sai Resort & Spa is on the east side of Ko Samui approximately half way between Chaweng and Lamai. Nestled in the misty mountains of northern Thailand, the serene Panviman Chiang Mai Spa Resort spreads out over 12 acres with breathtaking views of tree-covered, rolling hills and a charming valley. Built on a hillside, the resort is designed in a traditional northern Lanna style that gives it a unique and enchanting ambience. The large and well-equipped Viman Spa brings together the best of eastern body and mind treatments in a sanctuary of tranquility. You can choose from traditional Thai, ancient northern Lanna, Ayurveda, and water treatments. Deep-healing massages are available at an outdoor canopy bed with a splendid view of the fertile, green valley, or within the spa surrounded by a lush and delicately scented garden. 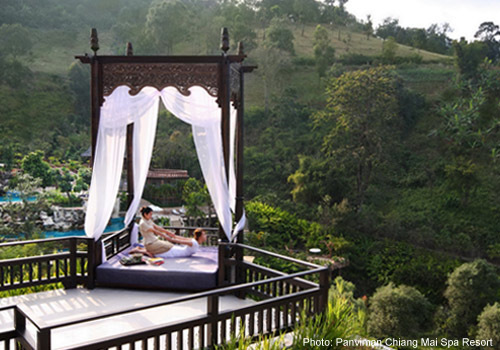 The Panviman Chiang Mai Spa Resort is located in the peaceful hills of Mae Rim, which is about 45 minutes northeast of the city of Chiang Mai. You can arrange for the resort to pick you up at the airport. Renowned for its fantastic limestone rock formations and sparkling beaches, laid-back Ko Lanta (Lanta Island) in Thailand’s southern Krabi province embodies the ideal of a tropical paradise. At the island’s south end, Pimalai Resort & Spa melds into 100 acres of verdant tropical forest that descends to a broad beach of sliver sand on the Andaman Sea. Created to take full advantage of the superb sea view, Pimalai Spa is comprised of a handful of delightful treatment salas built in the style of a traditional Thai village hut. An open-air Thai massage pavilion features a sublime view of the infinity pool blending into the sea. Pimalai Spa offers a complete range of natural and traditional treatments for the body and mind. Getting to Pimalai Resort & Spa is an adventure in itself. From the mainland in Krabi, where you’ll find the closest airport, you take a one-hour speedboat ride directly to the resort. 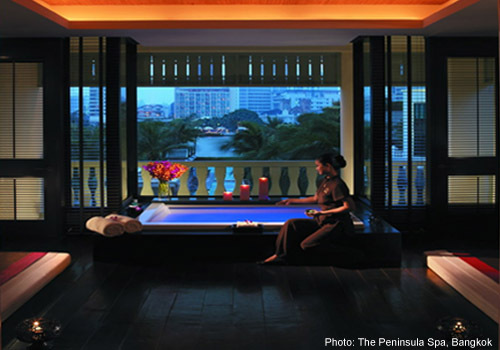 Even in Thailand’s dynamic capital, you can enjoy a spa with a mesmerizing view at the Peninsula hotel, on the more placid west bank of the Chao Phraya River in central Bangkok. It’s an oasis of calm in the heart of the big city. A short stroll from the main hotel building, the Peninsula Spa is in a three-storey Thai-colonial building surrounded by a pleasant garden. There are 14 treatment rooms and four suites, including two private spa suites and two river private spa suites. It’s a wonderfully satisfying experience to lay back in a deeply relaxed state while gazing at the busy waterway with boats silently gliding by, while the bustling city beyond the river seems a million miles away. The Peninsula Spa offers a range of ESPA signature treatments based on Thai, European and Ayurvedic philosophies. It’s easy to get to the Peninsula by taxi, or you can take the frequent shuttle boat to and from the east side of the Chao Phraya River. You deserve to immerse yourself in total relaxation at a Thai spa. It’s a most wonderful and rejuvenating experience, especially when your session includes connecting with nature outside while nourishing the mind and soul within. Life doesn’t get any better than this!